Is a Fixed Bridge Right for You? Home » Blog » All-On-4 » Is a Fixed Bridge Right for You? 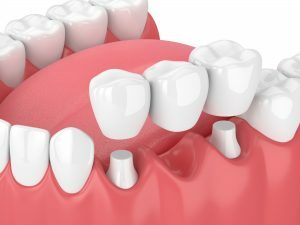 Should You Choose a Fixed Bridge for your Missing Tooth? If you recently lost a tooth as a result of an accident, periodontal disease, or other dental-related trauma, you may consider your replacement options. After all, a few dental solutions exist to remedy this situation including a fixed bridge, full and partial dentures, as well as dental implants. In the past, individuals could only utilize bridges or dentures to fix issues with missing teeth. Nevertheless, a fixed bridge still represents an ideal repair option in dentistry today. However, how do you know if a fixed bridge is the right solution for you? When you experience a badly broken or loose tooth, this could be due to periodontal disease or tooth decay. Missing teeth not only feel uncomfortable but also result in bone loss and the surrounding teeth drifting out of their natural position. Dentists have used dental bridges for a long time to fill spaces in the mouth due to missing teeth. A dental bridge can help preserve the shape of your smile, as well as prevent future complications. A fixed bridge is the ideal, permanent solution that looks and acts like natural teeth. Fixed bridges bridge the gap between two remaining teeth using a non-removable tooth called a pontic. Fixed bridges additionally enable you to chew your food and speak naturally while preventing further bone loss. Due to the fixed bridge’s stable foundation, the replacement teeth remain virtually indistinguishable from natural teeth while guaranteeing long-lasting quality and oral health. Is a Fixed Bridge the Right Dental Repair Modality for Me? Almost anyone that remains healthy enough for a routine dental extraction or oral surgery represent a potential candidate for a fixed bridge. However, you must possess healthy gums and adequate bone density to retain the implant. Unfortunately, if you suffer from uncontrolled chronic conditions like heart disease or diabetes, you do not represent an individual that can receive a fixed bridge treatment. These diseases will interfere with the healing process after a procedure. Children also do not serve as good candidates for a fixed bridge. Their bones and pallets are still developing. In these cases, a dental professional can cultivate a solution until the child reaches an appropriate age for a bridge. If your mouth is missing a tooth, a fixed bridge is a safe and affordable replacement modality. Dr. Andres de Cardenas will analyze your condition to determine if your remaining teeth and bone are healthy enough to support the fixed bridge. When you enter our dental practice, we look at you as a member of our family. For this reason, we commit to providing patients with the best possible care, in the most welcoming environment possible. 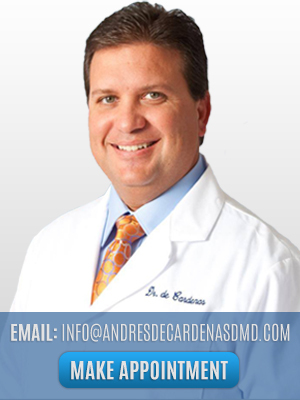 Dr. de Cardenas wields a popular reputation within the South Florida community for his gentle touch and preeminent dental expertise. This is precisely why our dental practice is such a valued resource for dental needs. While we do offer dental bridges as a component of our services, Dr. Andy will determine the proper course of action, discussing with you every step of the way. For more information on a fixed bridge and other treatment options, contact Dr. Andres de Cardenas today!